I noticed DJ's complaining that the APC40 doesn't extend to the send-return section. 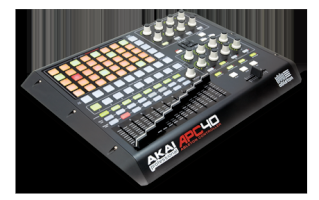 bank of 8 pan knobs on the APC40 for important parameters on your return devices. adjust the sends A and B for all your four tracks simultaneously. I think this all would work although I haven't tried all of it. as i got more and more into ableton i was using cds less and so just swapped the CDJs for an APC and a laptop for on the move! at the moment I'm just using my zero4 as my audio interface as it has a built in 4 stereo in and 4 stereo out interface. so I just have master sent to channel 1 and cue to channel 4... so i can cue. I am having trouble getting my head around send and return tracks and also how effects and devices are controlled by the APC... I have a load of effects on each channel... the same on every channel and I have been assigning the 8 rotary knobs in the "device control" section to these effects... but at the moment even if I am "in" channel 2 for example, I have to press "shift" then the button next to the red "2" to be controlling effects in channel 2... this seems crazy!!! Please tell me what I'm doing wrong! Not to sure I understand, but is it a genuine copy of Ableton and what version is it? Hi sorry for the lengthy reply, I have been on a long holiday! I got rid of the zero 4 and got myself a Doepfer Drehbank, such a nice piece of gear. And a new interface. Was a bit of a joke using a zero 4 as basically an audio interface! One thing I do notice however, the way I (and most people) mix is to bring in a section of one track (say the mid) and take away the same section of another track at the same time, especially with the bass. But to do this you need dedicated knobs for each channel, available at the same time. how do you achieve this with the APC? So I can have 8 extra rotary controls for every channel, 64 in total. Although I might actually want 16 for 4 channels as I use 4 channels for tracks and 4 for loops, acapellas etc. I would really welcome your suggestions or comments on how you use the APC in both its default setup and in your (probably) customized one. Sorry if I ask a lot of ambiguous questions, I will try not to pick your brains at this stage about Bome's midi translator, i fear that will be a headache for both of us!